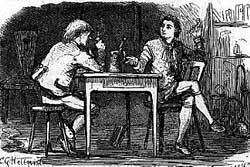 The two young students Linnaeus and Peter Artedi had a competition to see what groups of animals they had the best command of, and Linnaeus claimed victory when it came to birds. Artedi had to be satisfied with fish, which, however, did not help him much when, in 1735 on his way home from a late party, he fell in one of Amsterdam’s canals and drowned. In Systema Naturæ Linnaeus called birds “creatures of the air, gifted in song, winged, loveliest of them all,” and it was obvious that birds were the group of animals that Linnaeus liked best. Linnaeus and Artedi had a competition to see which of them knew the different groups of animals best. Uppsala University Library. As a student Linnaeus had attended the first ornithological lectures in Sweden, given by Rudbeck, Jr. in 1727–29, and as a tutor in Rudbeck’s home he had also carefully studied his Fogelbok (Bird Book). Linnaeus was very proud of his knowledge of ornithology, but posterity has been more skeptical, and it is easy to find ornithological errors in his writings, especially his juvenalia. On his journey to Lapland he takes a black stork to be a heron, and on his journey to Dalecarlia he mixes up a grebe and a loon. However, sometimes these errors are not the result of poor observation but rather of the confusion then prevailing as regards bird names. When it comes to knowledge of species, he was clearly bested by his predecessor Rudbeck, Jr., who was the first to describe more than 30 species new to Sweden, or at least to describe them for the first time in an identifiable manner. The corresponding figure for Linnaeus is hard to determine exactly, but it is a matter of 18 species at the most, and in only three cases can we be certain that Linnaeus was the first: the avocet, the hawk owl, and the hawfinch. Willow grouse taken from Rudbeck, Jr. Fogelbok (Bird Book). On the basis of these plates, Rudbeck gave the first ornithological lectures ever in Sweden in 1727–31 and during the fall semester of 1728 Linnaeus was among the students attending. When Linnaeus became a tutor in the Rudbeck home, he had the opportunity to study Fogelbok up close. Ornithology is so much more than knowing the names of species, and if you look at Linnaeus’ work in a somewhat broader perspective, he stands out as a founder and an innovator. Linnaeus’ contribution to ornithological research can be summed up under four headings. In his Fundamenta Ornithologica (1765) he begins with a brief history of ornithological literature before moving on to what ornithology as a field of research should deal with, under the following headings: Bird systematics, biotope selection, migration, mating, eggs and brooding, care of young, and diet. Linnaeus also lays out what a species description of a bird should look like and gives definitions of what is meant by ‘family’ and ‘order.’ Further, he touches briefly on the great utility of birds in nature, rounding off with the utility of birds to humankind. Just a couple of years after Linnaeus had studied Rudbeck’s Fogelbok he had a finished manuscript on the birds of Sweden. This manuscript, titled Methodus avium Sveticarum was not published, but it fulfilled an important function as an ornithological notebook where new species and discoveries were entered over the years. In 1746 Linnaeus finished a Swedish fauna comprehending all groups of animals. He called it Fauna Svecica, and it soon became indispensable to the field researcher. Never before had the world seen such a comprehensive and at the same time so detailed local fauna. Though perhaps Linnaeus should not be given all of the credit. 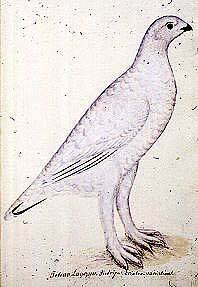 The number of new bird species reported in the two editions of Fauna Svecica was not more than about twenty. As mentioned, Linnaeus was highly dependent on Rudbeck, Jr., as regards his knowledge of species. Moreover, he had several other contributors to thank for a great many of the species in his fauna. However, the powerful surge in nature research in Sweden rapidly made Linnaeus’ fauna obsolete, and a second edition in 1761 helped only for a while. New species were discovered all the time, and a few incorrect determinations were exposed with time. As early as 1786 Samuel Ödmann submitted a proposal to the Royal Academy of Sciences regarding a revision of Fauna Svecica, but was turned down. Ödmann writes that the book has become difficult to find and that it costs three times what it is worth. Linnaeus spurred many followers to go out, with Fauna Svecica in hand, and continue to chart the birds of Sweden. In this he inspired a strong tradition of field ornithology that still allows Sweden to count itself among the world’s foremost countries in this respect. The first edition of Systema Naturæ provided a survey of the kingdoms of nature in 12 folio pages. Birds were not given much space, being covered in one third of a page. It is primarily the botanical system that made Linnaeus famous, but ornithology also gained a great deal from his work. The groundwork was laid here for a shared scientific language, a simple way of naming and describing the various species. Without this foundation it would have been considerably more difficult for ornithology to develop further. Systema Naturæ appeared in a steady stream of new and enlarged editions, and Linnaeus came to alter his bird system over the years apace with the substantial increase in the number of families. Above all, he had based his determinations of where a certain bird belonged on the appearance of the beak and the claws, a method that factored in too few characteristics to be fully satisfactory. 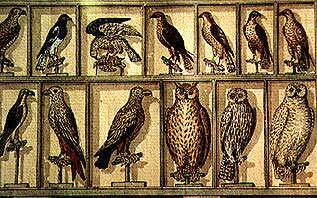 Nevertheless, Linnaeus’ bird system largely survived till the end of the 18th century. Accipitres (Birds of Prey); birds of prey, owls, etc. Picae (Spikes); woodpeckers, parrots, crows, etc. Grallae (Pipers); most waders, ostriches, etc. Passeres (Sparrows); passerines except crows, doves. As early as 1757 Linnaeus published the treatise Migrationes Avium (On the Migration of Birds). In an international perspective, this was a very solid start for migratory bird research in Sweden. The treatise presents not only the migratory habits of a very large portion of birds in Sweden but also the causes and purpose of their migration. Linnaeus also put forward a prescient suggestion that scientists should study the migratory birds of the southern parts of Spain and Italy, as well as near Istanbul. These three places are in fact the three major routes for migratory birds across the Mediterranean. However, the migratory bird research that Linnaeus outlined was never carried out. Just a few disparate essays were published in the late 18th century, primarily treating the arrival dates of migratory birds in relation to meteorological data. The aim was to use the arrival dates of the birds to try to predict the weather and thereby give advice to farmers. The value of these studies was hotly debated, as Linnaeus himself pointed out. This is what a bird collection could look like in the late 18th century. Boxes of stuffed birds covered the walls from floor to ceiling in the museum. Detail of painting from Museum Grillianum in Söderfors, northern Upland. These more phenologically oriented studies were rooted in the old farmer’s almanac, which Linnaeus tried to replace with a more scientific Flower Almanac. It is interesting to note that in the early 1750s Linnaeus advertised in Lars Salvius’ Lärda tidningar (Learned Journals) to get naturalists around the country to help him with reporting these phenological data. All for “the good of the land of our fathers,” of course. This was an early example of a central initiative for a nation-wide scientific survey, which later came to be a characteristic feature of Swedish migratory bird research. It was not until 1826 that any renewed interest in migratory birds could be discerned, and the Linnaean legacy in this field did not truly blossom until the late 19th and early 20th century. Insulander, Ragnar, “På Floras och Faunas förtjusande fält: P.G. Lindroth och ornitologin under 1700-talets andra hälft”, Svenska Linnésällskapets Årsskrift 1994–95. Insulander, Ragnar, “Svensk ornitologi under 1800-talet: En inledande översikt”, D-uppsats vid inst. för idé- och lärdomshistoria i Uppsala 1995.